The gallery of The Active Space is large and unusual. To hang any sort of cohesive show might propose a challange -- just imagine, one of the long walls consists of 10 foot wide sections interrupted by partitions. However, The Quantum Effect curated by David Gibson has successfully conquered this task. 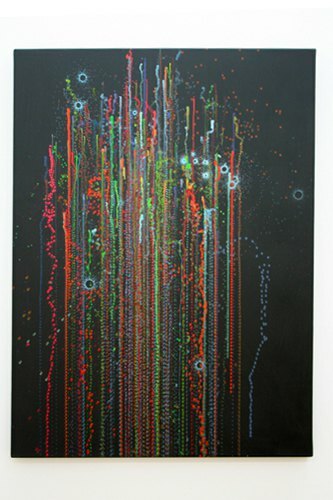 The overarching themes that link all of the works in the show are mysterious familiarity and otherworldly perceptions. A little space behind the curtains when you first walk into the gallery is dedicated to a set of four lightboxes with film, by Anne Arden McDonald. With titles like "Eyelash" and "Couples," they seem very intentional and about a certain event or idea of the artist's experience, but recognizable forms are scarce, besides a simple outline of a dress, a leaf, and what seems like sperm fighting to fertilize an egg. 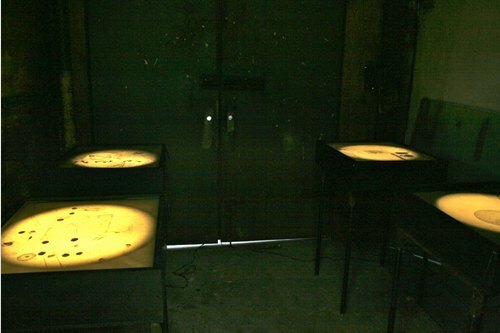 Each piece emulates the feeling of looking through a microscope, but at a thought rather than a known thing. The sculptures/collages by Jeanne Tremel are made of purposeful materials such as yarn, fruit, and a dishwashing rack, but she combines them in ways to make dreamlike and naive objects and scenes. They have the potential to be used, yet what for is unknown. They pair very well with the mixed media collages on newspaper by Elissa Levy. 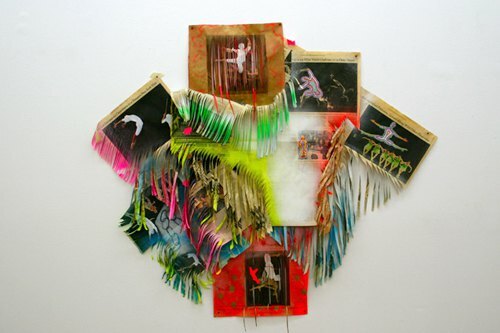 These too are works that could have been utilized (for reading the news) but the artist paints on and cuts them to transform them into mysteriously beautiful and domestic works. The viewer is curious about the stories that are covered up, but presented with the artists unique formal reactions to pictures and print. 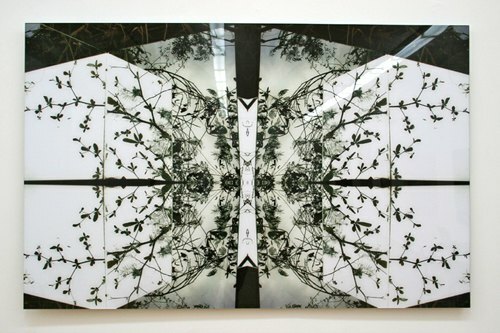 Madora Frey's large prints of either foliage or mysterious (construction?) 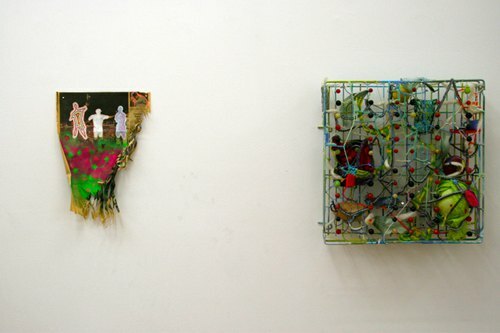 materials are more relatable to familiar objects than the rest of the work in the show, yet still distort perception to a unique degree. The scale and field of depth in the work allows the viewer to become immersed in them, but each piece belongs in a completely different environment and gives a hallucinogenic feeling of confusion. Work by Carter Hodgkin, Michael Zansky, and Jonathan Feldschuh all seem to relate in ways regarding their materials, mark-making, and color. 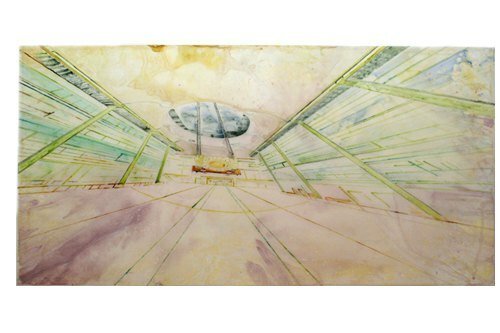 Hodgkin's paintings could be depicting aquatic life or remnants of celebrations, Zansky's seem to be surreal portraits of machines or decorations, and Feldschuh's, with titles like "Large Hadron Collider," may be interiors of industrial mechanics or an uncomfortable place. 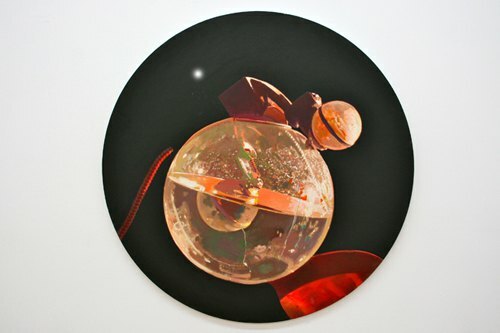 All use color in a dramatic way, Zansky's tondo canvases create a shrine-like illusion, and the scale and transparency of Feldschuh's mylar works allude to preparatory sketches while depicting warped perceptions. 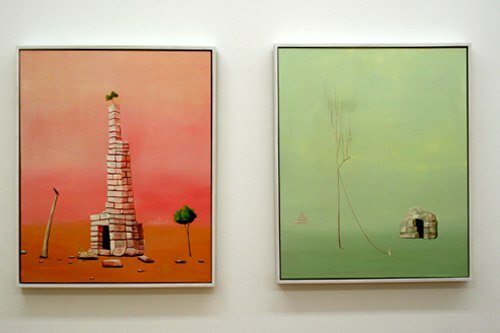 Thomas Frontini's two paintings stand out from the rest. In content, they are very much on par with the sense of mysticism and surrealism present in the whole show, but the richness of the color and peculiarity of the scenes really make them unique.